With there being two control areas off to the sides, Khador deploys his fast units (Eliminators + Solo Cavalry model) on the flanks with the IFP, Bears, Beast & Strakhov in the centre. 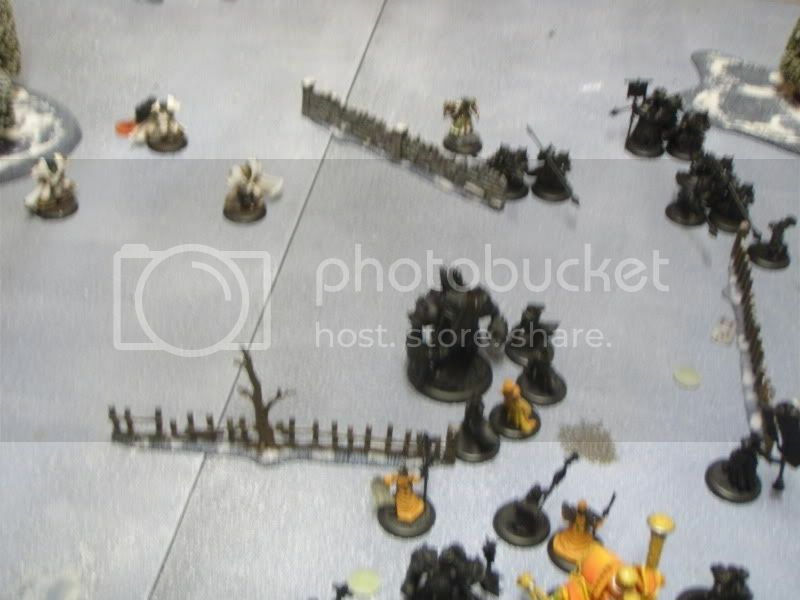 I deploy off to the right essentially giving the Khador player the left control zone but also ignoring the Cavalry solo and Eliminators on that side. Without any shooting Kreoss is going to be pretty safe as long as I deny charges on him and I have excess choir boys... TFG deploy the most centrally to delay the Eliminators/Cavalry if they flank with the Reckoner + Redeemer up front and all the support behind them. Errants Advance Deploy on right where the other control zone is. Everything runs up with Occulation cast on the Great Bears and Superiority on Beast. Eliminators + Cavalry solo make the control zone on the left whilst the Eliminators on the right hang back a little bit. The IFP didn't shieldwall so that's the order of the day against them. I'm very aware of Strakhov's feat and how fast...well everything can suddenly become - especially since a lot of the opposing army has Reach. I therefore give two focus to the Redeemer but none to the Reckoner. The TFG advance and shieldwall up the middle and behind the linear obstacle. The Errants run just into the zone on the right to be out of the Eliminators charge range and everything else advances behind the two Warjacks with the choir casting Battle Hymm. The Redeemer lobs three shells + Vassal and takes out four of the Iron Fangs. pKreoss casts Defender's Ward on the Errants & Lamentation on himself. Strakhov maintains both upkeeps but doesn't allocate any focus leaving himself on four (out of range of Kreoss). The Eliminators on the right move up to jam my Errants on the edge of the control zone whilst the Eliminators + Cavalry model on the left move out of the control zone to harass my flank with large run moves. The IFP advance further and Shieldwall with Strakhov moving behind them and a fence. Great Bears & Beast move up into the middle of the table. TFG charge/jam Eliminators & Cavalry on the left killing one Eliminator. The Choir cast Battle again (no need for anything else!) and half of them move up in front of where the Jacks will be placed to protect them from charges. The Reckoner moves up and blasts the Beast with a shell doing three damage - it promptly moves forward. The Redeemer stands still and lobs a couple (one + Vassal) shells at the IFP again but only manages to scrap one this time. Support moves behind the Jacks with Covenant casting no-KD aura, Rhupert Tough on Errants and Kreoss Purification to get rid of Superiority. The Errants then go and start charging stuff with four getting into contact with Beast, one with the IFP (and in the control zone) and five on the Eliminators on the right (and in the control zone). Beast takes some moderate damage, one Eliminator dies but everything else whiffs. Strakhov doesn't upkeep Occulation and gives three focus to Beast. He pops feat and moves towards the lone Errant engaging the IFP and tries to smack him silly with that rapid firing gun of his. He gets two shots but kills an IFP instead unfortunately. He's now centrally placed for extended charges on everyone basically. 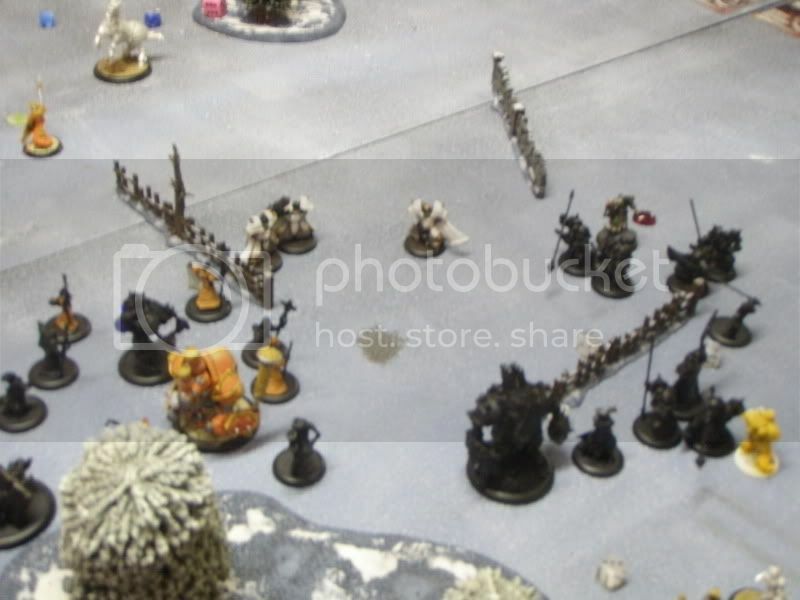 The Great Bears then activate and charge the Errants around the Beast to clear some of them out - two survive thanks to Tough but get trampled down anyway by Beast as he closes in on control zone on the right. There he threshers to kill some more Errants (no tough rolls here) and smacks another in the face before he runs out of focus. The IFP then activiate to try and finish off the Errants but only kill one near the Eliminators - they use their mini-feat to reform into Shieldwall. The Eliminator on the right fails to kill any more Errants leaving the Officer + two left alive. The Eliminator + Cavalry on the left take down two TFG as well. I only upkeep Defender's Ward here though it's probably not needed anyway. Three focus goes to both Warjacks. With Strakhov only on one focus it's all about feat time now - I don't pop it immediately though as I want to make sure if it fails, Kreoss is safe. The Choir activates to engage the Great Bears (doing no damage) and then the Reckoner smacks into the Beast where he kills it easily thanks to the Errant damage before. 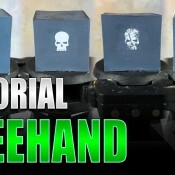 Kreoss moves up then and pops feat, getting all the IFP, Eliminator on the right & Strakhov. Redeemer moves up and drops all three Rockets on him with one boosted damage and overkills by a couple points with the extra Vassal shot to spare and game ends. 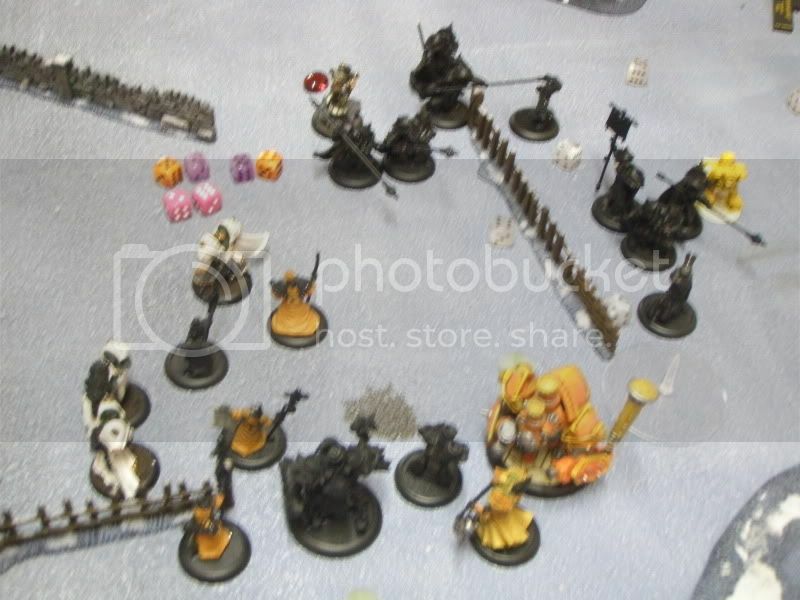 I felt the Khador player was trying too hard to get the scenario win Turn 2 which was going to be hard when there were seven Errants in one control zone with Defender's Ward, Tough and no-KD aura up. This put him in a position to be hit by the classic pop&drop when he could have defended against it with focus camping and/or trying to drop the Redeemer with extended charges from Beast/Great Bears. Even doing what he did but keeping focus on Strakhov would have proved a better idea IMO though he was losing the Beast without getting to any of my Warjacks. Otherwise pretty basic from me - Errants on a control zone, TFG jamming and Menoth fire shooting away! The list was pretty blah - particularly given I only had Reckoner + Redeemer to utilise on pop & drop... and Strakhov is Immune to Fire. Chuck in the Full Choir...? And ya, thrown together list though I did like having both TFG & Errants with pKreoss - something I haven't done before.